As a prince, my life is already complicated. I don’t need a relationship making things even more difficult for me. But there’s something different about Elle. I should know better, but now it’s too late. I find I’m willing to follow her to the ends of the earth, and I’m not sure what’s come over me. I should have stopped myself while I still could. She’s revealed herself—exposed her darkest secrets—and even those are not enough to push me away. I know too much about her now. And something about her makes me crave more. She’s under my skin. And I won’t rest until she’s mine. 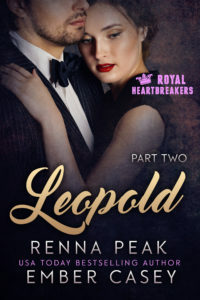 This is Part Two of a six-part contemporary romance serial by bestselling authors Renna Peak and Ember Casey. This episode ends with a cliffhanger.